In Paul’s second letter to the church at Corinth he is forced to spend a considerable amount of time defending himself from “false apostles” (2 Corinthians 11:13) who had accused him of: walking according to the flesh (1:12, 10:2); being deceitful (2:17, 4:2); intimidating in his letters (10:8-10); defrauding people (7:2) and ultimately questioned his apostleship (chs. 10-13). As part of his defense Paul said, “But in all things we commend [approving KJV] ourselves as ministers of God: in much endurance, in tribulations, in needs, in distresses…” (2 Corinthians 6:4) Paul is saying that everything he and his fellow workers had proven, by their conduct, they were true servants of God. 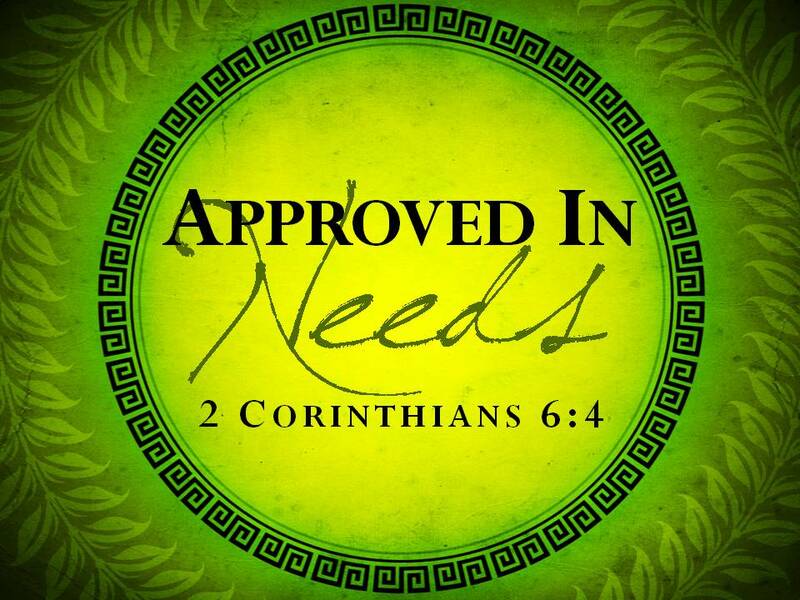 Let’s turn our attention on the phrase in needs so that we might better understand how Paul, and consequently ourselves, can be approved in needs. When Paul speaks about needs (or necessities KJV) he is not talking about the necessary things a person needs to survive such as food, water or sleep. Instead he is using a Greek idiom that means the unavoidable experiences of life which one must endure. It is in the way he reacted to the unavoidable experiences of life that Paul is saying he proved that he was a true minister of God. Sometimes when we read about Paul’s life; his travels, his tribulations, and his writings it makes hard to connect with him. We can’t even touch the hem-of-the-garment of the things that he has done… except in the area of the unavoidable experiences of life. In this one area of his life all of us can connect to him. In this one area we are equal in every way to this great minister of the gospel. Would you consider with me three of the unavoidable experiences of life which we must endure? Since Paul suffered from these same three unavoidable experiences we’ll use him as an example to learn how we to might be approved in needs before each other and our God. When one thinks of the burdens of life the first thing to come to mind is the bitter things of life that affect the mind and the body. The burden of illness affects us all and yet there are those burdens that, in God’s good providence, we are healed of. But there are those other burdens of life which there is no prospect of escape. Those other illnesses from which there is no recovery. They are thorns in the flesh, our messengers of Satan (2 Corinthians 12:7-10), burdens that the faithful live with until the end of their days. Paul lived with the burden of a thorn in the flesh, we suppose, until he died. The list of guesses as to what his burden was is endless. It ranges from everything from paralysis, to a nervous disorder, to blindness, to the temptation of unbelief, to having to use a scribe, to having a person in his life that annoyed him to death. But what I want you to see is that whatever his burden was, it was nothing more than what you or I can suffer. His thorn in the flesh, his burden, was not something that was supernatural in nature but something common. And he proved that he was a true servant of God in that he didn’t wallow in the mire of despair, instead he took pleasure in his burden and acted through the Lord’s grace and strength using his burden to God’s glory. Remember, no matter what happens to you, no matter what unavoidable burden you bear, God will help you through it by giving you grace and the strength you need. This is why Paul could say “we know that all things work together for good to those who love God.” (Romans 8:28) And “Rejoice in the Lord always. Again I will say, rejoice!” (Philippians 4:4). By putting our faith in God and His purposes we can, just like Paul, prove we are true servants by the way we handle the unexpected burdens of life. Do you struggle with temptations? Why sure you do. Can I tell you something, proving yourself to be a true servant of God doesn’t mean that you overcome each and every temptation that Satan throws at you. Just because you gave into temptation doesn’t disqualify you from being a true servant of God. It what you do once you’ve given into temptation that proves whether your true servant or not. Do you think Paul ever had to ask someone to forgive him for a wrong he committed? Sure. Do you think Paul ever confessed his sins and asked others to pray for him? If he was a Christian he did (James 5:16). Do you think that Paul ever stayed up at night thinking, “Why on earth did I do that?” Absolutely. So how did he prove himself to be a true servant of God if he gave into temptation? He would have done two things: First he would have confessed his sins to God (1 John 1:9). Second he would have relied on the blood of Jesus to forgive his sins (Ephesians 1:7). By doing these two things he proved himself to be a true servant of God. There is one last need that we should discuss and that is death. Sooner or later death comes to us all; from its cold grip nobody can escape. It seems that in times past man’s thoughts were focused on death. But now, as we tend to live longer, man’s thoughts seem to be focused on life. Death, like taxes, is an unavoidable experience of life. The apostle Paul was a man familiar with death, his life was threatened with death on several occasions. And yet we find in Paul a sense of great hope in his reward when death would finally find him. He told the church at Philippi that he couldn’t decided which was better, to live on and help them or to die go be with Christ (Philippians 1:19-26). Later on, he told Timothy, “The time of my departure is at hand… There is laid up a crown of righteousness for me.” (2 Timothy 4:6-8) When Paul faced the prospects of his departure from this life to the next he always did it with hope and trust that his Savior and his Heavenly Father would be true to their promise to “forgive sins” (Romans 4:7-8). Paul proved he was a true servant of God by the way he faced death. When a person has faith that being with Jesus is better than being here; when a person has hope that a crown of righteousness is laid up for them; when a person has put their trust in God to forgive them of their sins… then that person can truly say, “O death where is your sting.” (1 Corinthians 15:55) For the Christian, death is not to be feared but embraced as the portal to be with our Lord. By embracing death, Paul proved he was a true disciple of God. How do we prove we are true disciples of God? We faithfully face the unavoidable experiences of life which everyone must endure. The burdens of life, the temptations of life, and finally death. When we turn to the Lord and conduct ourselves worthy of the upward calling of faith then we have proved to the world that we are true servants of God. Other usages of this Greek word help us to see its meaning: compulsion (Philemon 1:14); necessity (Hebrews 9:16); distress (Luke 21:23); must (Matthew 18:7); necessary (Jude 3). All references are from NKJV. The Greek word here is diakonos which is translated: servants (Mark 10:43; Romans 16:1); minister(s) (Romans 13:4; 1 Corithians 3:5); deacons (Philippians 1:1; 1 Timothy 3:8, 3:12). All references are from NKJV.